Easthost Review 2019: Is Easthost a Good Hosting? Easthost is a Latvian hosting company that primarily offers cloud and shared hosting solutions. The vendor uses CloudLinux OS on their shared servers by default, but also offers several other operating systems for customers to set up their cloud servers. Easthost is a Latvian web hosting provider. This hosting vendor primarily offers cloud servers and shared hosting solutions. Other services you can expect from this company include domain registration services and email hosting services. The Easthost website is available in Latvian, Russian, and English. 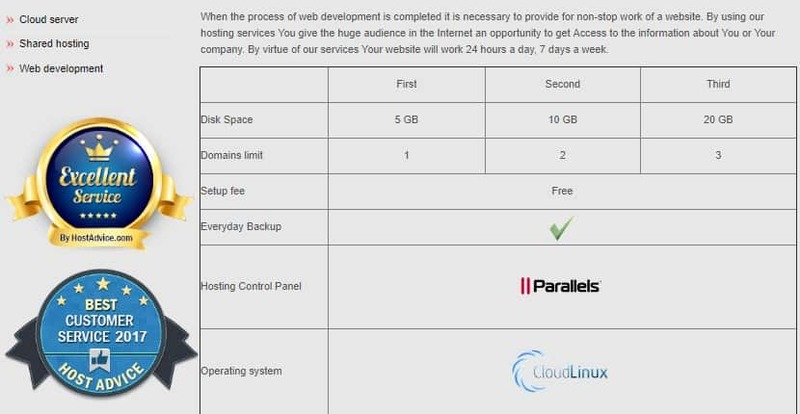 As you can see, while they seem to have made an effort to optimize their servers for speed, they’ve got a few things that count against them: namely, that they only offer support for up to PHP 5, and they don’t offer many perks such as a free domain registration, free SSL certificates, or even a one-click app installer. It seems that with Easthost, you’ll have to purchase all of these things from a separate vendor. Also, note that Easthost uses the Parallels control panel. This isn’t as popular as cPanel, but it is still relatively easy to use. With their cloud servers, Easthost offers several operating systems for customers to choose from, including FreeBSD, CentOS, SuSE, Debian, Ubuntu, Fedora, and Windows Server. Customers decide on their preferred cloud servers based on the amount of RAM and disk space they need as well as the number of CPUs they require. Easthost allows users to pay extra for additional resources based on the growing needs of their businesses, and then scale down in the event their resource usage decreases. A quick scan through this vendor’s website quickly reveals that this company has provided very little information about their hosting solutions. There is hardly enough information to help potential customers make an informed decision or give them the confidence to trust this vendor. In fact, it’s hard to tell when this website was last updated. One would be given to think that the vendor has been out of business for quite some time, or that at the very least, they’re not fully operational. Furthermore, Easthost’s email hosting services section redirects to Garmtech, suggesting some kind of partnership that the vendor does not explicitly state for their customers. There’s not enough information to conclude that this vendor is still functional. Considering the lack of features, Easthost’s cloud and shared hosting services are expensively priced. Further, all plans have notable restrictions that will rack up extra costs over time, especially if your website often exceeds your preset resource allocations. This vendor offers a 20-day free trial period. However, their relatively long order form and tedious checkout process will be off-putting to many users who have gotten accustomed to the immediacy and convenience the internet affords. Easthost’s customers can pay for their subscriptions every month, annually, biennially, or even every three years. The longer a user pays in advance, the cheaper the hosting price, though these discounts are too insignificant to really offset all the extra costs you’ll be covering. Easthost’s support team is available via email, phone, Skype, and social media channels, including Facebook, Draugiem.lv, Twitter, and Одноклассники. This vendor has no blog, knowledge base, or FAQ section for DIY-inclined individuals. My multiple attempts to contact this vendor were to no avail. The phone number seemed disconnected, their support team did not answer any of the emails I sent them, and I could not find a way to open a ticket. With Easthost, users must proceed with the utmost caution. Given the meager amount of information on their website and the lack of user-friendliness, there’s not much to suggest that this is a trustworthy and reliable vendor. Wondering how Easthost stacks up against other Web Hosting companies? Enter any other Web Hosting company and we will give you a side-by-side comparison.